Mysteries of #Gravity: Why we enjoy a SciFi film set in make-believe space more than we enjoy actual people set in real space. Why Bullock's hair, in otherwise convincing zero-G scenes, did not float freely on her head. Satellite communications were disrupted at 230 mi up, but communications satellites orbit 100x higher. Nearly all satellites orbit Earth west to east yet all satellite debris portrayed orbited east to west. Why anyone is impressed with a zero-G film 45 years after being impressed with "2001:A Space Odyssey." When Clooney releases Bullock's tether, he drifts away. In zero-G a single tug brings them together. Why Bullock, a medical Doctor, is servicing the Hubble Space Telescope. How Hubble (350mi up) ISS (230mi up) & a Chinese Space Station are all in sight lines of one another. Astronaut Clooney informs medical doctor Bullock what happens medically during oxygen deprivation. None of which means he didn't have fun watching the movie, but if anyone is ever going to stand still and be quiet when science is at stake, it's probably not going to be him. "That was three-weeks-worth of Tweets in one evening. 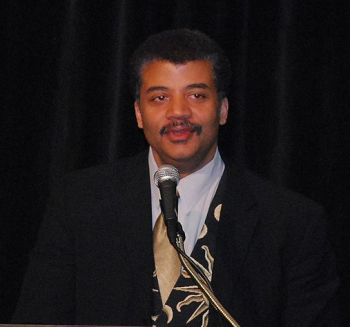 Sorry to overload your Twitter streams," deGrasse Tyson concludes. "Good night universe."